How does a fancy new tool and $500 sound? That’s what Dremel is dishing out this week with their new Dremel Ultra-Saw, a 3-in-1 tool that’s like their Saw-Max (which I own) except it’s cranked up a few powerful notches. In addition to making flush and plunge cuts in all sorts of materials (wood, metal, plastic… even tile and stone!) it can also do surface prep like grinding off old thinset or stripping paint off metal and concrete. 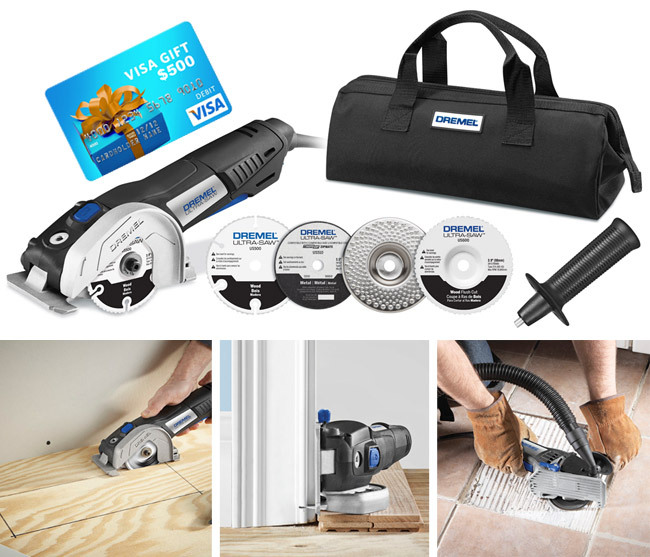 And Dremel is throwing in a $500 Visa gift card so you can take it for a spin (literally) on whatever project you dream up. Please use the Rafflecopter widget below to enter (it might take a second to load, but it should eventually pop up below this paragraph). This giveaway is available to residents of the United States (but we have an international giveaway coming your way next week). I have the Multi-Max and the Saw-Max, and they both come in handy for specific tasks. I don’t use them often, but when I do I’m glad I have them. They were both especially helpful in projects like laying the hardwood floors upstairs. What a great Father’s Day gift this would be! Thanks for the contest! I just picked it up for Father’s Day! My husband is going to LOVE it. What an amazingly crazy giveaway. You guys are awsome. Thank you so much. OO Awesome this could be handy for our new house we are buying. Oh my gosh i don’t think I’ve wanted any of your give-aways more than this! fingers crossed! I just got an email from Domino highlighting you as one of the DIY blogs they highly recommend. So cool! Ahhh! That’s so crazy! Thanks for the heads up Amy! This would be the best father’s day present for my dad! He is in the middle of so many home projects, and this would definitely speed them up! Dremelovely! Dremel dreaming of diy adventures! You know what I love best about YHL giveaways? No gimmick or hoops to jump through or pages to like or tweets to share…just click to enter. I don’t do facebook or twitter or instagram (I know…dark ages :) ) So I appreciate a giveaway I can choose to enter. Not sure if this is just me or maybe I accidentally clicked on something, but when I came to the page, it changed to “A message from our sponsors” and an ad played. There was a button in the corner that said “take me to the site” so I clicked that but it went to the site for whatever was being advertised, not your blog. I had to refresh younghouselove in order to get back. Just a head’s up :). ACK! That’s so bad. So sorry Sonya, we never allow those “ad takeovers” so someone must have slipped rogue code into something without our permission. Do you remember what it was an ad for? A screen shot or even a company/product name can help us block it. One of those popup quiz/poll type ads showed up yesterday or the day before for me. It was one of those blue ones that fly in from the edge. Sorry, I can’t remember the name of the ad anymore. So sorry Jessica! Thanks for the tip! The same thing happened to me yesterday. I came to your page and within a second or two, the entire screen filled with a “new page”. A small window in the upper right hand corner said to click to “go to site”. It was surprising how fast it came over my screen and I quickly clicked out of it, before paying attention to any brand or name. I’m not at all opposed to seeing ads on blogs – you need to make money for your hard work. It just was odd because I haven’t seen that type of “ad” before, here or on other blogs. This would be amazing to win. A great 5th anniversary present! :) Thanks for all your amazing giveaways. Hubby was just saying he needs one of these to work on the many new home projects we have! This would be awesome!!!! Gahhhh! I have been pining for a Dremel for years…crossing my fingers big time. Thanks for this!! I just bought the Dremel 4000 for my husband for Father’s Day (because john seems to use his a lot). And this weekend we are using your tutorial to strip and refinish our deck. Wish us luck! We just moved to Richmond and have more space than we know what to do with! We’ve got tons of project ideas, so this bad boy would totally come in handy! Thank you for the great giveaways, and inspiration to go with! I married a Handywoman. Every week we’re doing a new project. Just think of all the fun things you could do with this thing! My wife would LOVE this! I haven’t entered many of the giveaways because we were renting and didn’t have the space/need for a lot of the freebies. But since we just bought our first house (squeeee! )I will be entering all the giveaways like a mad fool!!! YAY! Ahhh! This tool looks amazing- I’ve been eying it to get started on my own DIY home projects- first up, a new closet! Lots of summer projects coming up that this would be incredibly handy for! Totally unrelated to this post…but, I found your voice twin: Mila Kunis. And I found it while watching this video of her last night on Kimmel. :) You know, like on ‘Friends’ with the ‘hand twin’…you have to share this with someone. So, I found your voice twin and I’m sharing! :) Ha! I funny! Other people have told me that too! This would be amazing to be able to give to my husband. He works so hard for us. He is an over the road truck driver and we only get him home on the weekends. He has been putting off projects for years due to his limited time home and lack of necessary tools. So sorry! Are you at work and they might have blocking software? Have you tried on your smart phone? Sometimes that’s a way to get around it! What an incredible giveaway! Thank you! What an awesome giveaway! Thank you!! This would be great! Currently tackling a lot of house projects. This is one of those giveaways that makes me wish you had a different policy around receiving free stuff! Maybe it’s just me, but I wish the policy was that for everything you would be willing to receive, the sponsor would have to give one to your readers (then everyone wins). Because I’d sure love to see what you guys would do with some of the sponsor items. I vote for a policy change! This is one of the tools that I have been coveting and drooling over for a few months! Awesome! Yeeeeeeessss. I would love both of these. Something that can cut tile would be so nice to have when we get around to redoing the bathroom. This might not be the best place to post this question, but here goes anyway! We are in the process of buying our first house and it’s in pretty good shape, but there are little tweaks here and there that we want to DIY. Such as, add crown molding, tile the backsplash and around the fireplace, possibly add decking to the backyard, etc. We don’t currently own any power tools except a weed wacker! What do you suggest in terms of a saw? Is this dremel a good starter tool that could be useful for a bunch of little projects? The saw I use most often is my miter saw, since I can do quick straight or angled cuts on boards up to about 8″ wide (though they sell bigger models, which I would’ve totally bought had mine not been a hand-me-down). That will serve you well in projects like crown molding and decking. I find my Dremels are good for smaller tasks – like getting into a tight spot or where I want handheld control. I’ve used them to cut existing moldings (like the one that’s pictured above) or even for random projects like sawing the posts off our bed. But for big tasks with lots of cutting involved (installing new molding, decking, etc) you’d probably want something a bit more heavy duty. You can also try renting tools (like at Home Depot or True Value) before you buy in case you think you may only need them for a project or two. Congrats on the house! My hubby would love love love this! I NEED This. We have been looking to buy something like this second hand because we can’t afford it, would be so helpful for all sorts of projects. What a cool tool! I know this is really off topic but have you guys heard anything about when the items from the show house will be donated to the Restore? I checked with them Memorial Day weekend & they said they aren’t told when the items will be coming in. I know you mentioned giving locals a heads up so just checking! Thanks! The house is being used as a model for the moment, just to show off everyone’s hard work a little longer before it gets disassembled. But once the shipment goes off to the ReStore (it might be across a few of them actually) we’ll give you guys a huge heads up! Random question, did you guys hang a shelf in your last homes living room using brackets but turning them upside down? I tried looking for that post with no luck. I’m looking to do that with a shelf in our closet and wondering how you accomplished this and if it would hold up just as well. Thanks!! I always check young house love for any home improvement ?’s I have :) and you guys always have a solution and/or answer! was just looking at this yesterday, my fingers are crossed! cuteness had never really existed until these pictures! What a great giveaway! It would definitely make a wonderful Father’s gift! Even if I don’t win – you guys do the best giveaways! !